Do you find yourself eating a lot of nuts because they are considered a healthy snack or addition to recipes? Those who follow a Paleo, vegan or vegetarian diet tend to eat a lot of nuts because of their healthy fats and protein content. However, if nuts are a big part of your diet, you should be soaking your nuts. What, did I just say? Yep, you heard me. Nuts, seeds and grains contain enzyme inhibitors and phytic acid which protects the plant, but binds or chelates with key nutrients like zinc, manganese, phosphorous, iron and other minerals which isn’t great for humans. I typically soak raw walnuts, almonds, and pecans in purified water with some salt. If I’m doing 1 cup of nuts then I cover the nuts with 2 cups or so of water. Soaking time varies depending on how hard the nuts are. Almonds need about 6-12 hours, while walnuts and pecans need 4-5 hours. 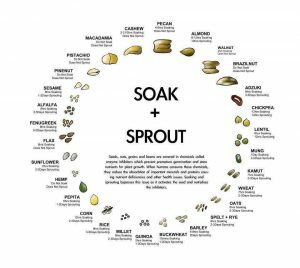 Certain nuts like Brazil nuts, pine nuts, and pistachio nuts, do not need soaking. 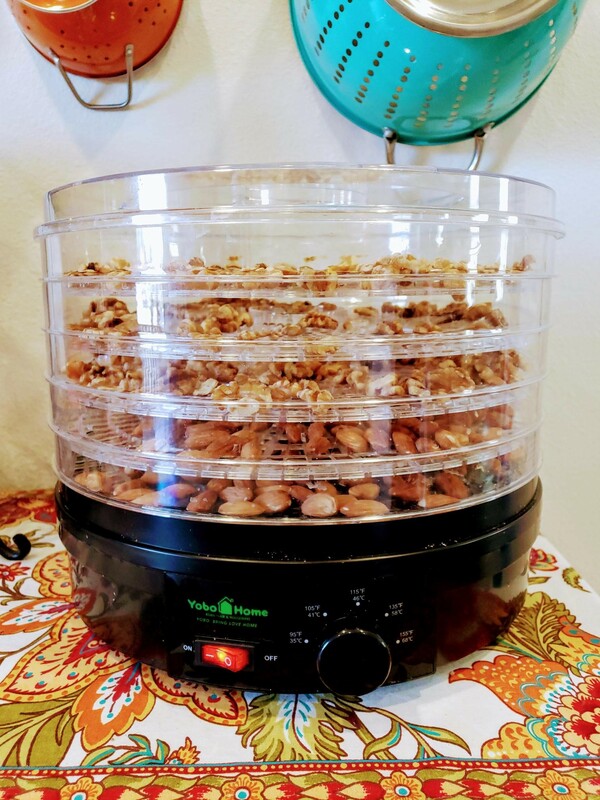 After soaking my nuts I then use a food dehydrator which gives them a light, crispy crunch. This is my adjustable temperature dehydrator. I use the 109° setting because the nuts are still considered raw and active. The live enzymes stay intact and make the nuts more nutritious. I believe this dehydrator cost around $30 on sale. You can get some really fancy ones that cost several hundred of dollars with rectangle trays which are great for making your own wraps and raw crackers, crusts, etc. For nuts, dried fruits and vegetables, fruit rollups, and simple things, an inexpensive dehydrator is all that you need. Different types of nuts take a different amount of time to dehydrate. For instance, 24 hours or less is enough time for walnuts or pecans to get them nice and crunchy but it can take 2 or 3 days for almonds. It’s important to rotate the trays during the dehydration period. It is not necessary to dehydrate soaked nuts if you are going to make nut milks right away or add to pestos. You can keep soaked nuts in the refrigerater for up to a week, but they will get moldy if you don’t use them fast enough. Dehydrated nuts will last for several weeks. Soaked and dehydrated nuts are easier to digest and you’ll prefer the taste once you get accustomed to preparing them like this. Oh, and you should soak brown rice, steel cut oats, and other grains, as well, for several hours before you cook them for the same reasons. Don’t soak white rice; It will turn to mush. Roasting nuts also eliminates some of the phytic acid, but the nuts are not longer consider raw and active. For more detailed information, here is an excellent article by Wellness Mamma. PreviousPrevious post:Enchilada Sauce (gluten-free, paleo, vegan)NextNext post:Wine: Friend or Foe? I guess I am going to buy a dehydrator! I can’t wait to use soak, dehydrate and eat the nuts the way you suggest. 1) Is the dehydrator you show in the picture an inexpensive one? It looks like a good one. 2) If you are going to soak the nuts should you still buy raw or organic or raw and organic nuts? 3) if you soak the nuts and then use them in the dehydrator, should you refrigerate them or can you leave them out in jars? Will one last longer then the other? 4) I always buy nuts without the skin for easier digestion. Do you agree? 5) I usually buy, almonds, pistachios, walnuts, pecans and cashews. Do you think these are all good nuts to soak and put in the dehydrator? Should I avoid any of them? 1) I only paid about $30 for the dehydrator in the picture. Look on Amazon. They are pretty low-tech so most anyone should do. 2) Only raw nuts will work for soaking and dehydrating. 3) Once nuts are fully dehydrated you can store outside the refrigerator in a baggie or jar with tight fitting lid. 4) Skinless nuts are great, but they may have been blanched and therefore soaking and dehydrating won’t be necessary. 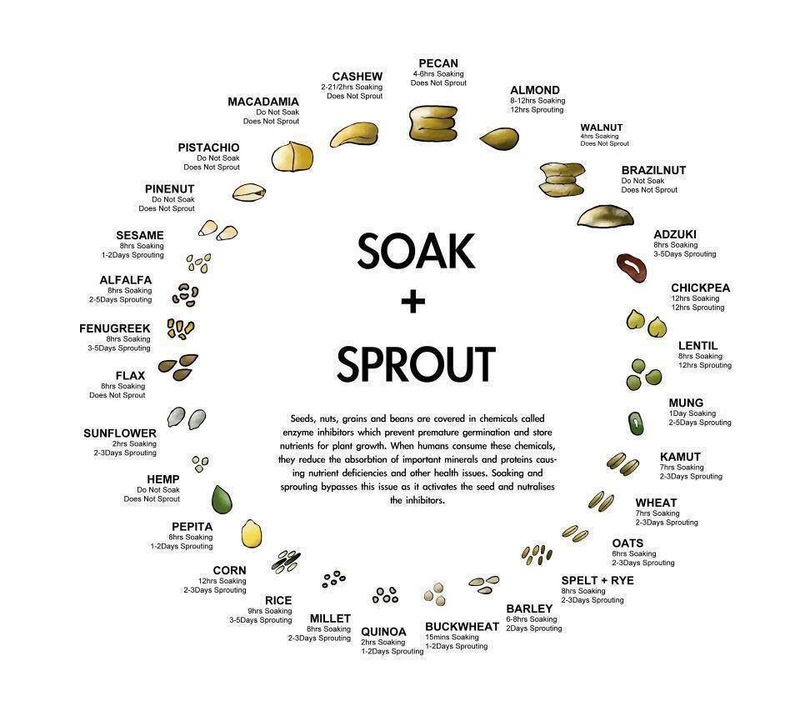 5) See chart in the middle of the article on which nuts are appropriate for soaking.